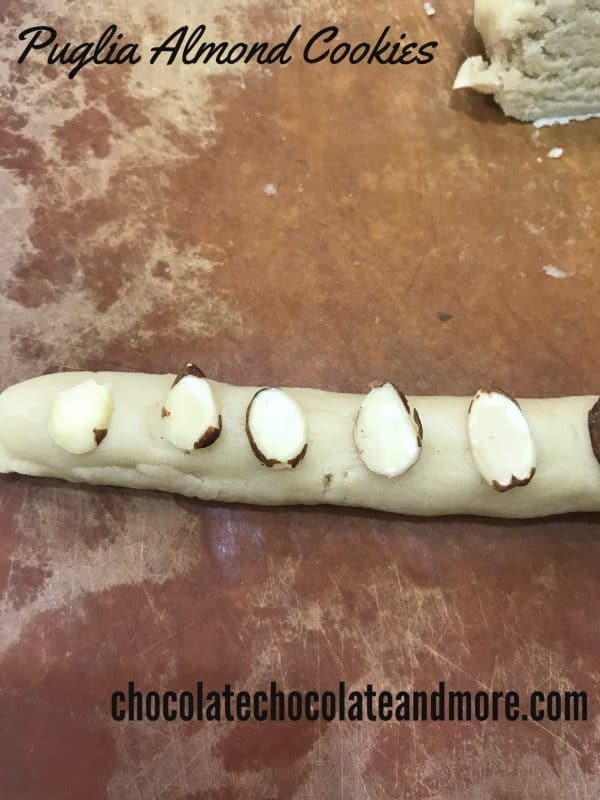 Puglia Almond Cookies - Chocolate Chocolate and More! Puglia is a region in Italy where they make these delicious little almond cookies for all of their family events. Puglia almond cookies are a top seller in the local bakeries, and mothers and grandmothers bring them out for baby showers, weddings, and any other type of happy event. 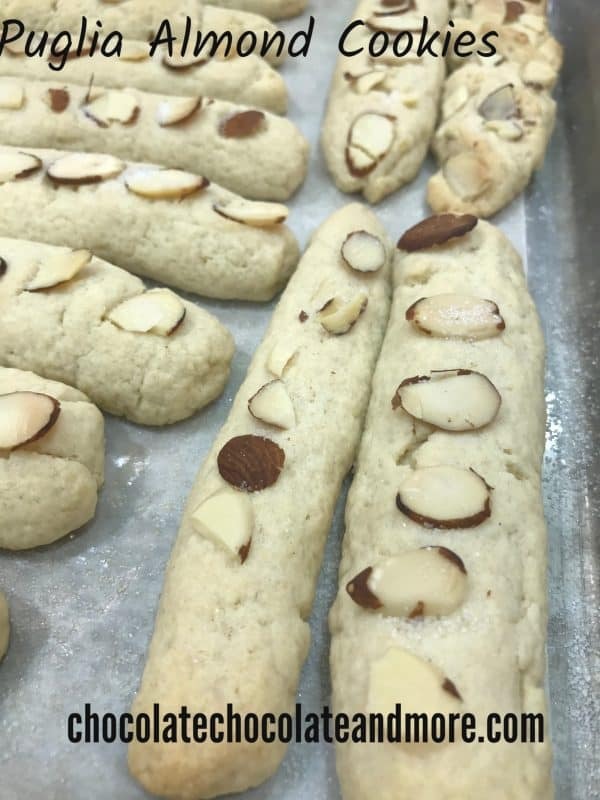 According to Southern Italian Desserts by Rosetta Costantino and Jennie Schacht (where this recipe originated), the traditional form of these almond cookies are made in a “twist” design, and are meant to represent the “union between a baby and God, or between spouses”. I tried this recipe in a recent class on Southern Italian Desserts at my local Sur La Table in Arlington, VA, and it is super simple to make. I know these are almond cookies, but they also include a little bit of white wine as part of the recipe. If you are averse to alcohol in your version, you can substitute the equivalent amount of water with a dash of almond extract, or even some white grape juice. What I really like about Puglia almond cookies is that you can store them for two weeks — assuming you have any left that is. Just place them in a air-tight container and leave them on your counter to grab and go, or nibble on after lunch or dinner. I have discovered they are a great nibbler with a nice cup of coffee or tea as I read the morning paper or a book. 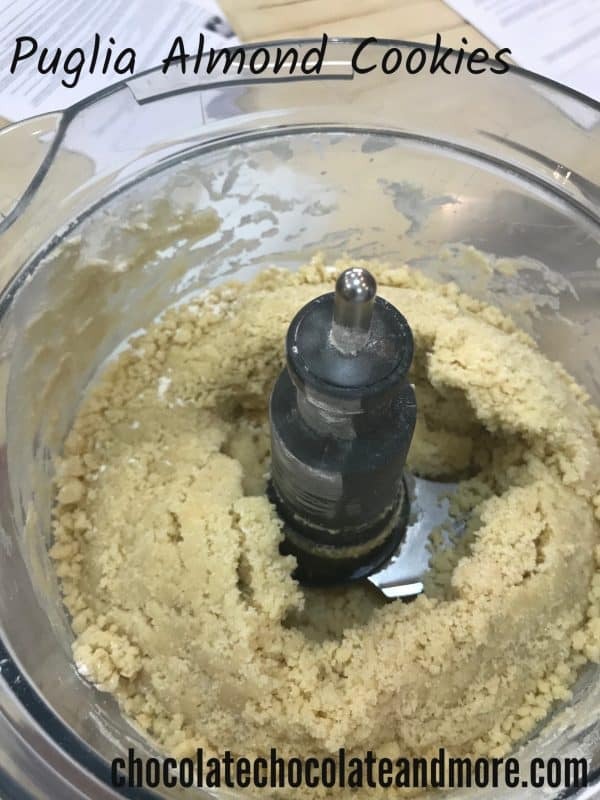 In a standard-sized food processor, combine the flour, sugar, baking powder, and salt, pulsing until mixed well. Add the butter, oil, and wine, and continue pulsing in the food processor until sticky dough is formed. Transfer to a flat surface and knead briefly to form a smooth dough. Wrap the dough in plastic wrap and refrigerate for at least 1 hour. Roll a piece of dough like you are making a thin rope; the end result should be about 10-inches and about 1/2 inch thick. Take the ends of the rope and bring them down to meet, and then gently twist the two strands around one another to form a twist. Press the ends together at the bottom to seal them. Put the 1/4 cup decorating sugar in a shallow bowl, and press each cookie into the sugar so that it is coated on the top. Starting on the bottom rack of the oven, bake the cookies for 15 minutes; after 15 minutes, move the cookies to the top rack and bake another 15 minutes, or until the cookies are golden all over. Once the first batch of cookies is done, remove them from the oven and allow to cool while baking the remaining batch of cookies. There’s no almond in theses cookies? Just what’s on top? The cookies pictured are not twisted. Does this mean they it is not required? Correct. You can twist them if you like or just make the flat ones.